Are you planning to upgrade to use Omnifocus Web? Curious to start the discussion, are you going to upgrade to use Omnifocus Web? Why or why not? No, because I already have it on all the devices I use (iPhone, iMac, Macbook, and iPad) and have no need for internet-exclusive access. It’s not an “upgrade” but more of a complementary way of using OF3. OF for Web has basic features and missing a few features in its current incarnation. It isn’t on the level of Todoist web site functionality yet. But it’s a good start. I’m in the camp of bringing an iPhone and/or iPad to work if I don’t have a Mac computer at the office. I am also comfortable with using the free OmniFocus Sync Server to email tasks into my OmniFocus database. Not now, as I have access to OF 24/7 if desired, but I expect to eventually subscribe as the feature set grows and I’m very glad it’s there and being refined now in case I end up in a Windows environment. Therefore I’d probably only subscribe if/when the web interface allows for “native” integrations with services like IFTTT or Zapier, otherwise I have no need at present. I have used OmniFocus (2) from 2015 to 2018. In August 2018, I switched to Things. There are things I will miss in OmniFocus (no pun intended) like the very slick design. Yesterday, I installed OmniFocus 3 on my i-devices and learned to like it again because of the powerful possibilities the application definitely has. 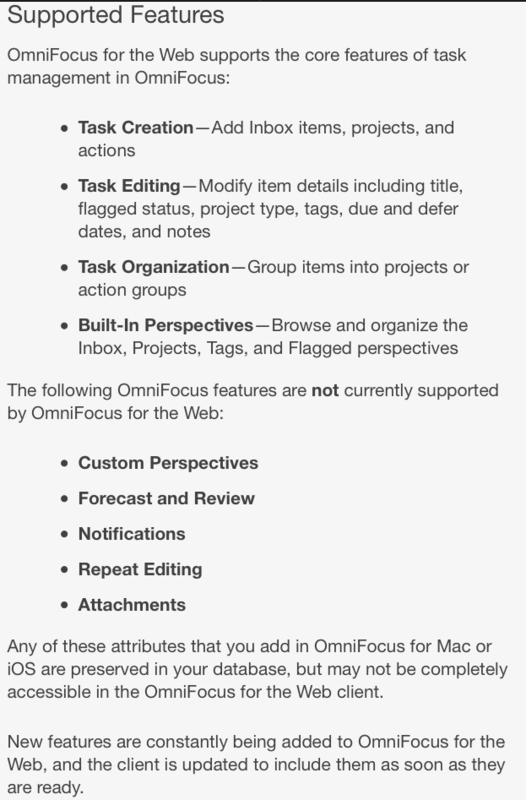 OmniFocus Web is bridging the gap I experience when working at the PC at work, even if the web option is more basic. What I am not sure about is the licensing. In order to use OmniFocus 3, I will have to purchase the app on my Mac and on my i-devices which will cost me about 80 to 90 Euro (upgrade pricing from version 2). And on top of that, I will have to pay for OmniFocus Web. As an alternative, I could switch to the subscription route. With OmniFocus 3 having been released in 2018, I guess that OmniFocus 4 will not be released until several years from now, so it might be cheaper for me to go for the upgrades and to subscribe to OmniFocus Web, when it will be available as a separate option? Correct? 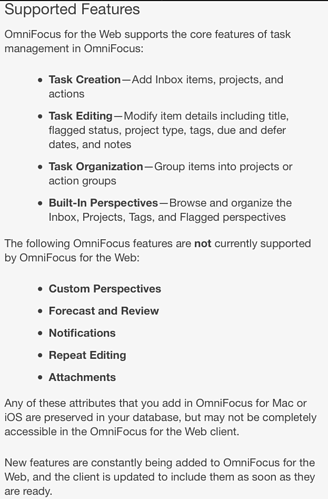 Is there a release date for OmniFocus Web as a separate option? It sort of boggles my mind that the OmniGroup has put out the abillity to subscribe to the whole thing but not the individual OmniFocus Web option. Given the fact that they still stress that they encourage their customers to buy a license, it smells a bit funny. When the web service goes fully live you’ll be able to sign up for just web, but that’s not here yet. I have access to OF on various Apple devices throughout the day so do not see a need for the web version. I will evaluate upgrade vs subscription costs when OF4 is released. Omnifocus has priced me out. I have gone back to apple reminders with good task. are you going to upgrade to use Omnifocus Web? Why or why not? I will upgrade, there are other things in the new upgrade that will be helpful but no I will never use the web version. Security and privacy issues are my reason. If you have an encrypted database, doesn’t running omnifocus on the web require decrypting your database to use the web service? I could be wrong, but if not I’ll pass. When you use OmniFocus for the Web, you connect directly to a copy of OmniFocus running on our servers. That copy of OmniFocus decrypts your data temporarily in order to send it to your browser (via a secure connection). To keep OmniFocus for the Web responsive, the copy of OmniFocus you’ve connected to may continue running after you log off. If it’s important to you that no unencrypted data is ever on Omni’s servers, you should not use OmniFocus for the Web. For more details, read How Security and Encryption Work in OmniFocus for the Web. Some users have more than made up the price of the OF3 purchases. It all depends on whether it fit your setup. GoodTask and Reminders is a good workflow too. As other said I have no need for the web version, even with a windows pc at work. I have always with me my iPhone and the iPad, so if I need task management I rely on those devices: I don’t find any friction in using a different device for task managing (the less I use the pc the better ). That’s the camp I’m in too. I have it for the platforms where I need it, so it’s no big deal. When they roll out OF4 in a few years I might reconsider the monthly subscription model, since OF tends to be rather pricey as an up-front investment - but having just put the money into OF3, I’m not eager to shell out more. It will be interesting to see if the paid upfront price will be brought up to the subscription price level, that is higher, as of today, if we consider an approximate 4 year life span of the apps (mac versions of OF2 was released in 2014 if I remember correctly, and OF3 in 2018). Generally, apps with both up-front and subscription prices effectively offer a discount for paying up-front, so I wouldn’t take the subscription price as a sign that the up-front price of the app will increase. I don’t expect the up-front price to skyrocket, but by the same token a $10/month subscription price would give somebody the ability to evaluate the software a bit longer and make a better decision. Or for somebody with budgetary constraints, it might make more sense to pay monthly than to shell out $120-ish for the software up front. Ken explained (somewhere…) that they see $5/mo as roughly equally financially beneficial to the upfront pricing when cancellation risk and the time value of money are factored in.